GREEN BAY, Wis. (AP) — Mason Crosby survived one of the worst seasons of his career by putting together five of his best. 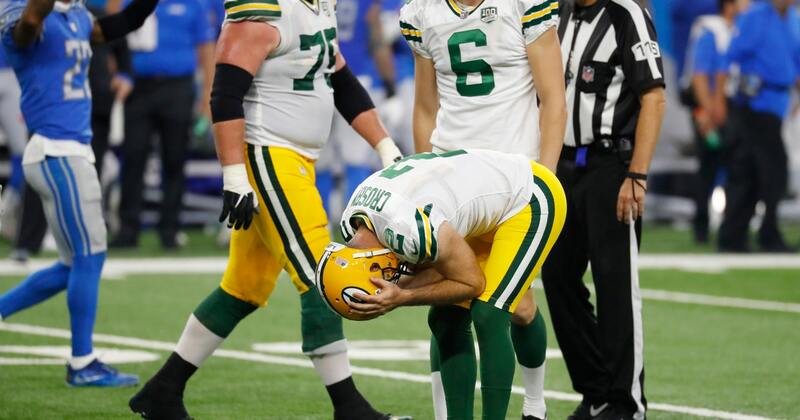 The veteran Green Bay Packers kicker isn’t looking at what happened in 2012, when he made just 21 of 33 field-goal attempts, as a pathway to bouncing back from a nightmarish performance last week at Detroit. Crosby missed four field goals and an extra point, those 13 lost points looming large in a 31-23 loss Sunday. He had never missed more than two kicks in a game in his 12-year career. “I look at what happened on Sunday as I’m lumping it into one kick, one entity,” Crosby said Friday. “That was a game, that was a moment, that I couldn’t have ever imagined happening, but it did happen and I can learn from it. I don’t reset, I don’t go looking for things. It’s more, all right, get back into it. What am I going to do better this week? How am I going to improve? That’s what the Packers are counting on heading into Monday night’s game against San Francisco. The Packers didn’t bring in any veteran kickers for a workout this week. Just like in 2012, they’re banking on Crosby’s body of work. Change has become the new normal for Crosby. From 2010 through 2015, Crosby had the same snapper (Brett Goode) and holder (Tim Masthay). This marks the third consecutive season with a new operation, with Green Bay drafting JK Scott in the fifth round to handle the punting and holding and Hunter Bradley in the seventh to handle the snapping. Bradley has had a few off-target snaps, but the snapper-holder combination wasn’t to blame on any of Crosby’s five missed kicks. Special teams coordinator Ron Zook likes what he has seen this week. NOTES: QB Aaron Rodgers was a full participant in practice after aggravating his injured left knee when tackled by Lions LB Christian Jones on the opening possession. “Kind of a step back to last week, the beginning of the week,” Rodgers said. He wore a new, lighter brace in that game and hopes he’ll be able to wear it again against the 49ers. … RT Bryan Bulaga (knee) and backup Jason Spriggs (ankle) were added to the injury report as limited participation. If Bulaga plays against San Francisco, he’ll line up next to RG Byron Bell, who has taken over that position for Justin McCray, who started the first three games. “Been consistent. He has a lot of experience,” coach Mike McCarthy said.